Learn how to roast corn in a fire pit or fireplace, with or without foil. Each how to roast corn in a fire method has its advantages and disadvantages. But both are simple and delicious. Whether you are using a fireplace or an outdoor fire, the basic procedure is the same: Roast your ears of in a bed of coals, not in the flames of a fire. After your fire is well established and you have coals, use a shovel to move the coals to one side of the fireplace or fire pit. Continue your fire on the other side of the fire pit or fireplace. 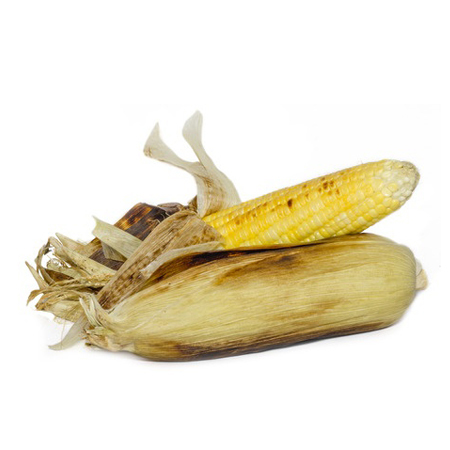 When serving the cooked corn, wooden, disposable corn on the cob holders can be tossed into the fire after use! Shuck your ears of corn. You have your choice of completely removing the outer husks and silks or just pulling them down to the bottom of the ears. If you pull them down, the husks will serve as your handle for each ear, so don’t wrap the husks in aluminum foil and leave the husk-handles sticking out of the coals. 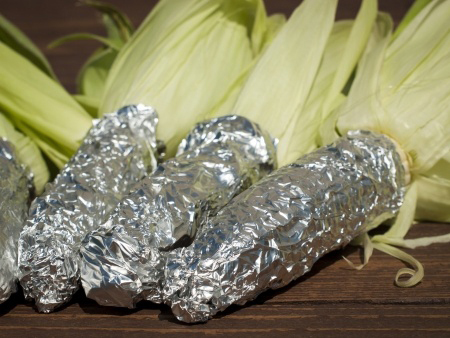 Roast the foil wrapped ears of corn in the coal bed for about 10 minutes. Poke an ear with a fork to confirm whether they are ready for butter, salt, pepper and eating. You can prepare the ears ahead of time. With the husks pulled back, you have a ready-made handle for removing the ears from the coal bed. If you’ll be eating outdoors, the foil wrapper provides a convenient “plate”. Before wrapping the corn in foil, you can season it with butter, salt, and pepper or you can wrap a slice of bacon around each ear for added flavor. This method results in ears that more closely resemble corn that has been cooked inside. Particularly with children, familiarity matters. Getting all of the silk off is a bit of a nuisance, but a corn brush desilker helps significantly. You cannot dispose of the aluminum foil in the fire – it can give off toxic fumes when burned. There’s something very satisfying about roasting an un-husked ear of corn directly in the coals of a fire, just the way our ancestor did long ago. Remove the ears from the water and shake off excess water (you don’t want the water to extinguish the heat in your coals.) Put the ears into a bed of coals. Using long, outdoor tongs, rotate the ears at least once to promote more even cooking. The outside husk will darken, even turn black. Due to the water, they will take longer to cook, about 15 minutes, than foil wrapped cobs. Remove from the fire’s coals and the husks and silk will fall right off the cob! Season and eat. Because they have been soaked in water, they almost never burn. This method makes removing the husks and silk a piece of cake. Corn on the cob cooked this way will have a unique, slightly smoky flavor. After your meal the husks can go back into the fire, making clean-up super simple. Someone has to remember to start soaking the ears at least an hour before cooking time. You cannot pre-season the corn before it cooks. 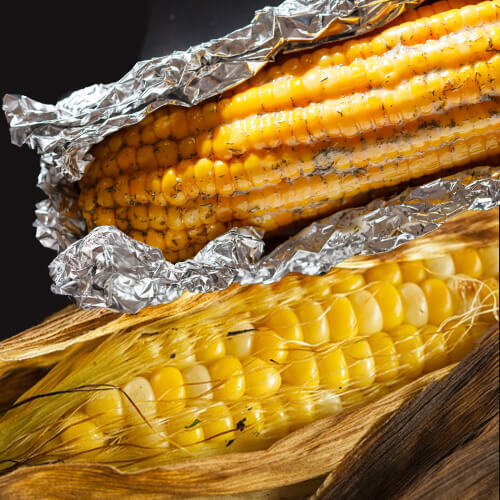 Whether you use the built-in wrappers Mother Nature provides or employ foil, these tips will show you how to roast corn in a fire pit, fire ring, or fireplace with perfect results. Cooking in the fireplace or fire pit turns the meal into an adventure for kids and a memorable event for adults. See directions and tips for cooking other foods in fire pits here. Last updated by Susan at August 6, 2017 .